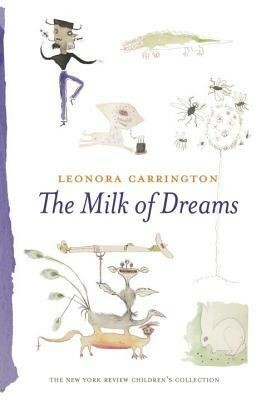 Leonora Carrington, New York Review Children’s Collection, hb. 978 1 6813 7094 1, 2013, £11.99, 60pp. This slim book contains some of the stories, poems and illustrations that the painter Leonora Carrington created for her two sons. Carrington was a surrealist, born in England and who spent most of her life in Mexico. Known mainly as a painter, she was also a writer, with a published novel, memoir and short stories. This collection has been compiled by her son and has been handsomely published for the first time by the New York Review of Books. It could be said that children’s writers have anticipated and absorbed aspects of surrealism and made them acceptable even in the nursery: say Alice in Wonderland, The Shrinking of Treehorn or Not Now Bernard. In this collection there are short episodes equally appealing in their strangeness: for instance, of a boy with big flapping ears, whose head takes off like a bird and has to be lassoed with string and stuck back on with chewing gum. But there is some rawer surrealist stuff, meant to shock the bourgeoisie: a child who pees on passers-by from a window and is, in turn, peed on by a horse and an elephant. There are monstrous creatures and monstrous behaviour. Some tales and characters proudly advertise their nastiness: ‘The Horrible Story of Little Meats’ which features ‘Mrs Dolores Catapum de la Garza [who] was old, ugly, a nasty person, and smelled of caca’. None of the stories are very long and many, in the surrealist manner, defy narrative logic, appearing as a series of sometimes alarming and inconsequential incidents, including the butcher Don Crecencio cutting off the wings of flies with scissors. Although some of Carrington’s cartoon drawings are reminiscent of Spike Milligan (himself touched with surrealism), little of this comes across as playful or humorous. While the colour illustrations of strange creatures and characters might act as an introduction to Carrington’s paintings, the stories have none of the mesmeric mystery of her complete artworks. The stories seem weighed down by their fascination with the unpleasant. Carrington has become much more fashionable outside Mexico in the years since her death and this seems to me to be more a book for adults interested in her work than one to have a wide readership among children.